We’ve all had them. Those conversations that stick with us long after they are over. Looking back on my career so far, I’ve had a handful of conversations that have pushed me to grow and have helped shape the businesswoman I am today. As I made my way to the executive suite at our corporate headquarters, I was excited. I had a meeting with our Chief Operations Officer Kye Mitchell – someone whom I’ve looked up to for years. This was the first opportunity I had to spend time with her one-on-one, and I was ready to soak up all I could. Smiling, as usual, Kye welcomed me into her office. After some pleasant small talk, we dove right in. 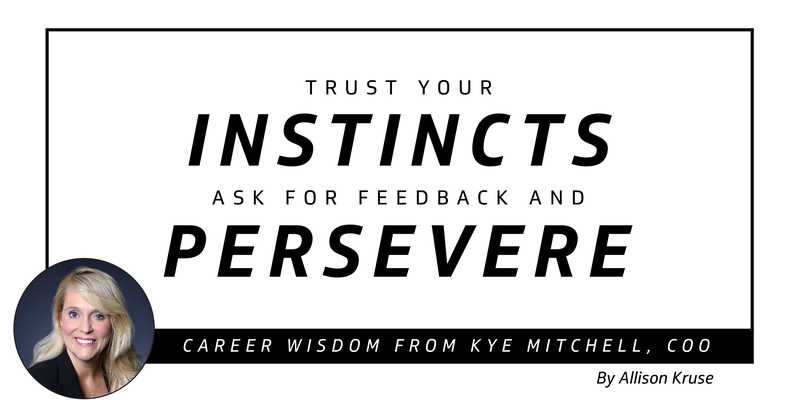 Kye, if you could talk to Kye Mitchell at 20 years old, what would you tell her? The biggest lesson I wish I would have heeded when I was young, whether in my personal or professional life, is to trust my gut. That little voice in you that says “don’t do this” or “you should do this” is usually right. There have been times in my life that I did not trust my instincts and I had to deal with the consequences. I knew something was off, but chose to ignore it – and then paid the price. It took me until I hit 30 years old to understand that my gut was right 99 out of 100 times. Even today, when I don’t listen to my gut instinct about a person, I usually end up regretting it. Trust your instincts. Is trusting one’s instincts a skill that improves over time? Yes. Learning comes through life experiences and professional maturity. I think people who succeed in this business are naturally highly intuitive. They know how to read people, but they may not listen to their inner voice. People in the beginning of their career need to learn to pick up on signals when something doesn’t seem right, and then be proactive in exploring the situation further. Do you think younger professionals may be nervous to speak up? Some younger people may be intimidated and not talk to their manager when something feels off. It takes courage to bring up a topic that is potentially uncomfortable. However, if something is off, it is your responsibility to get on the phone or meet with your leader and discuss. After all, a good manager will always be available to listen to his or her employee. It’s important to keep an open line of communication. Conversations between employees and managers can be tough to navigate – especially when providing and accepting feedback. I think a lot of us are performance-driven people, and feedback discussions can be particularly challenging. If you are a top performer and are used to “getting all A’s” and then you get a “B-,” it can devastate you. This happened to me when I was young, and the way I responded made my manager quit the performance review! [laughs] He had to stop the conversation. That’s happened to me before too! I agree with you that the better the relationship is between the employee and manager, the better the employee will take that feedback. Yes! When you’ve established an authentic relationship with your employee, then when it’s time to deliver feedback, the employee knows it’s coming from a good place. This applies to other relationships too – whether it’s a recruiter giving feedback to a candidate, or an account manager giving it to a client, the better the relationship you have, the better the feedback will be received. What should managers say when providing feedback to employees? I’d say something like “I really like what you’re doing here, and here is how I think you could improve in this area. If you improve, you’re going to be unstoppable and take it to the next level.” I have told employees that I care about them, and that’s why I am bringing it up. I have even told them the conversation is uncomfortable for me too, but I truly want the employee to get better, so that’s why we need to talk about it. You need to have trust in the relationship so both people can be their authentic self. Kye, you’ve obviously been successful in your career. How do you push yourself to improve? I love it! Who taught you how to do that? I don’t even remember who it was now! [laughs] But it really stuck with me. It’s important to take notes, write things down, think it through. This can be especially critical for leaders who manage a large group of people. It is on them to take responsibility to learn and improve their skills. When I’ve trained new sales leaders, I’ll ask them what two things they did well in a meeting, and what is one thing they could do better next time. That sounds like an effective training method. It’s a valuable way for leaders to frame the conversation with people they are working with. It helps establish trust in the relationship. It also works well with our customers. We can’t take it for granted that our customers love us – we need to communicate how much we appreciate the opportunity to work with them, and ask them “What are a couple of things we are doing well, and what are a couple of areas in which we need to improve?” And then listen to everything the customer is telling you. What career advice do you have for our readers? Well, all of the above [laughs]. Also, constantly learning, practicing, and taking copious notes. Being authentic in your relationships and persevering. Persevering is the key to making it! This business can knock you down like a wave, or it could pull you in. Sometimes you’ve got to swim horizontally before coming back to shore. Technology changes, business changes, and to be successful you’ve got to evolve with the times. People won’t always treat you with grace, but you must keep moving. You’ll hit brick walls in your career – but the only way to prove to yourself you can get up and over that wall is to persevere through adversity.